An administrator user should not have automatic expiration of password as this will lock you out of the computer if the password is not changed on regular basis. Another condition can be when you are accessing your computer remotely. If the password expires, you won’t be able to reset it remotely and will need physical access to the system. 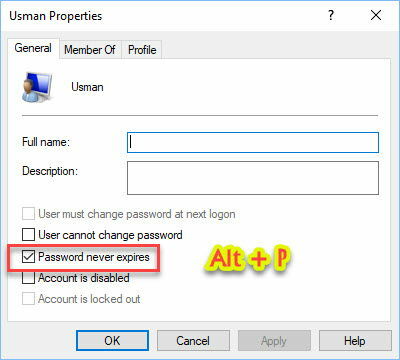 How to set Windows local user account passwords to never expire for all users. 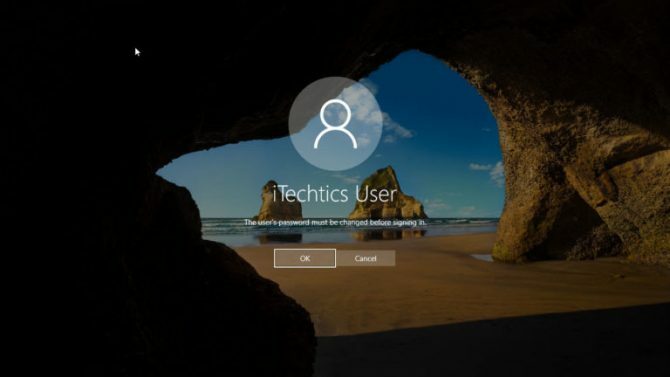 How to set Windows local user account passwords to never expire for a specific user. If you are using Windows 10 Home edition, you can enable Group Policy Editor for Windows 10 Home Edition. Windows makes it easier for us to manage local users of the system. Go to Run –> lusrmgr.msc. This opens user management console. Select Users from the left hand menu. Right-click the user which you want to configure and select Properties. In General tab, check the checkbox “Password never expires”. Or simply press Alt + P keyboard shortcut. In the right-hand pane, select “Maximum password age” and set it to 0. Setting the maximum password age to zero will disable the password expiration feature in Windows. If you are comfortable with command-line or want to do this remotely, you can use Windows commands for enabling and disabling the above mentioned policies. Replace ‘itechticsuser’ with the name of user you want to configure. Press Windows Key + X + A keyboard shortcut sequence to open PowerShell with administrative privileges. Replace itechticsuser with your desired username.